In its recent decision in the case of Bratic v. Rubendall, No. 21 EAP 2013 (Pa. Aug. 18, 2014) (Op. 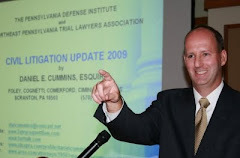 by Eakin, J., with Castille, C.J., Baer, J., Todd, J., and McCaffery, J. joining)(Saylor, J., concurring), the Pennsylvania Supreme Court essentially widened the discretion of trial court to grant a transfer of venue under the forum non conveniens doctrine when witnesses hail from distant counties. In the Bratic case, the trial court had been persuaded to transfer venue from Philadelphia to Dauphin County by the fact that eight of the witnesses were located in Dauphin County. On appeal, the Superior Court held that the Defendant did not provide enough information to properly demonstrate that the original venue in Philadelphia was oppressive. The Pennsylvania Supreme Court responded by indicating that the standard for showing that a Plaintiff’s chose of venue is “vexatious and oppressive” as outlining the Supreme Court’s ruling in the Cheeseman case should not be read to require Defendants to provide detailed specifics about the venue change would impact the parties. The court admitted that it was “unsure what extra detail must be enumerated” but noted that “interference with one’s business and personal life caused by the participatory demands of a distance law suit is patent.” The distance that parties or witnesses would have to travel was deemed to be an important consideration in this analysis. Anyone wishing to review a copy of the Supreme Court's Opinion in Bratic may click this LINK. Source: Article by Max Mitchell: “High Court Widens Trial Judges’ Prerogative to Transfer Venue,” The Legal Intelligencer (August 22, 2014).